As a comprehensive system supplier, the HÜBNER Group manufactures key components for the transportation industry – for buses, airport technology, automobiles, trucks and rail vehicles. 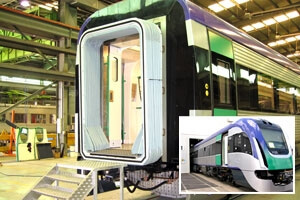 The range of products and services for the rail vehicles includes Articulation Systems, Bumper elements and front spoilers, Driver cockpit, Folding bellows and gangway systems, Window systems, Finger protection profiles, Ramp systems, PUR molded foam components as well as products made of rubber and injection molded plastic. With its international structure, the HÜBNER Group maintains close and creative contact with the market. Thinking globally and acting locally for the benefit of our customers, we are continually expanding into new countries and new markets. There, together with our customers, we produce individual solutions and innovative product developments with the highest level of technical precision. Worldwide more than 1,800 highly qualified employees serve the HÜBNER GmbH and form the driving force for our quality, efficiency and growth. Whether in trams, subways, rapid-transit, regional and long-distance trains or high-velocity trains, HÜBNER gangway systems are providing reliable service worldwide. Our flexible gangway systems offer a maximum of convenience and safety. Observing the requirements of our customers, we manufacture folding and gangway bellows as well as flexible gangway systems even for large capacity high-comfort gangways with interior trim for all types of railway vehicles. Our expertise in design and choice of materials has made us a reliable and capable contact in the railway industry. Based on innovative plastics production processes, we develop and manufacture complete systems from PUR foam in order to minimize the risks of injury for pedestrians in railroad traffic. The front section of older tram generations often hold a higher risk of injury to pedestrians. In order to improve safety and appearance of older vehicles, HÜBNER GmbH developed a solution that embraces this problem: the paneling of critical collision zones with energy-absorbing integral foam elements. HÜBNER supply a complete solution for the refitting of new front and bumper elements – from the conceptual design (incl.a 3D data model), through prototypes up to the final series production with pre-assembled components. HÜBNER is able to supply the whole area between the individual cars as a self-contained system. Our complete gangway systems generally contain the following components: folding or gangway bellows, top and bottom joint (as swivel or tilting joint), air conditioning duct, portal frame, articulated floor (consisting of a turning and a floor plate) and cable guide duct. We set the exact scale together with our customer. A balanced design and a careful selection of materials ensure low-maintenance gangways and a long service life. HÜBNER supply various ramps for rail vehicles. The EXEO II is a fully automatic lift system which ensures hindrance-free travel in high-floor rail vehicles. Electric Ramps are quick and easy solutions and extend and retract in just 9 seconds. The Folding Ramp is the ideal retrofit solution. When folded together, it can be hung on space-saving wall brackets, ready for operation at any time. Finally we have the Manual Ramp. This hand operated solution helps those with restricted mobility get on trams. It is simply integrated into the vehicle floor. Available in various sizes up to a load capacity of 350 kg, also as a plastic or heavy-duty version. HÜBNER joint and cover profiles made from flame-resistant rubber meet the international norm requirements such as DIN 5510, NFF 16101, ASTM, BS 6853.